After doing our research on DIY CNC kits, we decided that the BlueChick V4.2 was the one which best fit our needs. 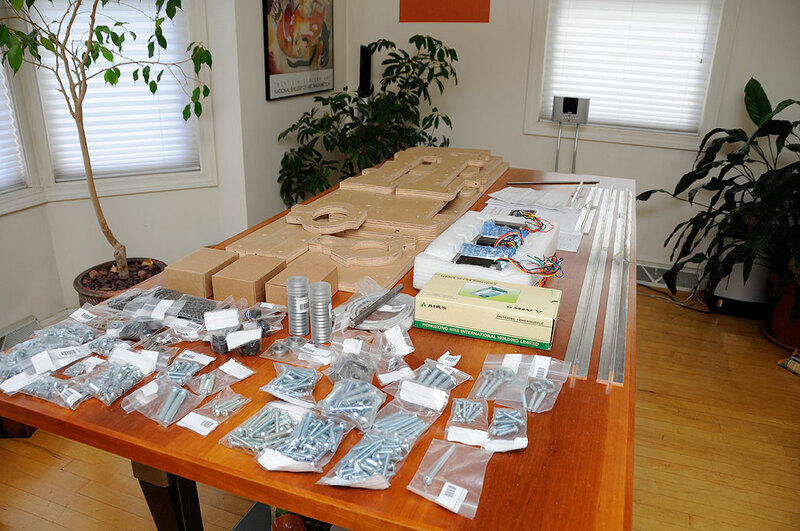 The complete kit ncludes: frame, hardware (screws, cross dowels, etc…), mechanical components (gears, bearings, etc…), and electronics (motors, driver boards, etc…). Purchasers of the kit need to provide: computer, cable/wires, and a Porter Cable 892 series router . When assembled, the BlueChick v4.2 CNC machine will have a routing area of 12″x36″ with 3″ of Z-axis travel. It should be more than sufficient for us to cut all of the pieces required to make the various Boyer kinetic sculptures. The kit came in three separate shipments and took about a week for it all to arrive. That is actually fast, considering they don’t cut the frame until an actual order has been placed. The frame is, of course, cut using a CNC machine. We unpacked everything and laid it out so we could do a check against the packing list. As all of the pieces were clearly labeled, the interns were able to quickly confirm that we got everything. The great thing about this kit is that the entire unit can be assembled with just a few simple hand tools. There is no drilling or cutting involved. We are going to spend the next few days putting this BlueChick CNC machine together. Look for the complete assembly write-up next week.